Canopus, a JV company of Cargill (USA) and TTS (Romania) has awarded Golfetto Sangati (Pavan Group) a contract to design, manufacture, deliver and start up a new shiploading terminal in the Port of Constanta in Romania. The scope of supply includes one TRANSLOAD mobile shiploader, rated at 800tph (tonnes per hour) and the relevant handling equipment from truck intake to storage and ship load-out. The new terminal is scheduled to be commissioned in the second half of 2014. 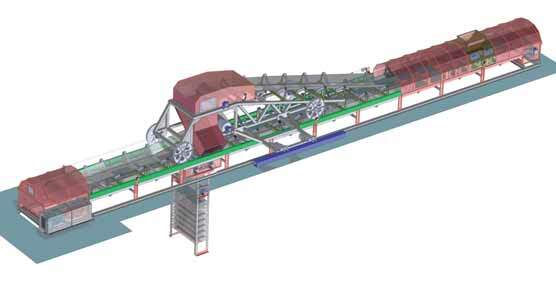 The picture above shows the conveyor belt, 1,200mm wide and 138m long, with tripper connected to the shiploader. All equipment has been designed and built according to client specifications. Golfetto Sangati can provide fully customized solutions to meet client specifications for any kind of ship-unloading, ship-loading and cereals handling.